If anyone has any idea where to find a picture of sackcloth, I would appreciate that information. Traditionally Bedouin tents were made from goat hair. Not only is it a strong fibre, it also swells when it becomes wet and therefore provides a water-resistant cover in rain. Here’s a close-up of the fabric of the Bedouin tent we have at the Cobb Institute of Archaeology, Mississippi. 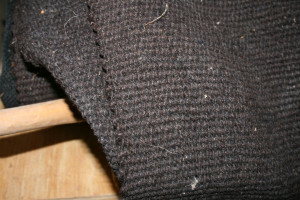 Goat hair was also used to weave mantels. The goat common in Palestine is the black Capra mambrica. It is this characteristic black color which gives rise to the praise of the beloved in Song of Songs (SS4:1): “Your hair is like a flock of goats descending from Mount Gilead.” The goats have long, hanging ears and the sizeable horns of the billy goats are noticeable. Peasants in Palestine did not regard the character of goats highly—they are definitely less placid than sheep. But this also means that they are more likely to fight predators. My own reading of Zelma Wood Lawyer’s book ended abruptly, when I misplaced it. My copy was a yellow hardback. Recently I have been researching my aunt Zelma and her husband Ray Lawyer. My cousin Kathy Wyler is their remaining surviving daughter at age 90. Their story has been told in several books. Zelma wrote a book after her return from Africa in about 1928. The title of this book is “I Married a Missionary” and is likely out of print but may be available in some of the Christian University library’s. Jeannie was their first child and she was born in the United States and was about 3 when they traveled to Northern Rhodesia to work in the mission field. Northern Rhodesia has in recent years changed its name to Zambia. Before Jeannie’s death a few years ago she completed a book with the title “I Dream of Jeanne”. Rick Ritter and the Four Corners church at Stillwell have some of the few sound preachers and churches in Oklahoma. A special teacher, preacher and song leader too.